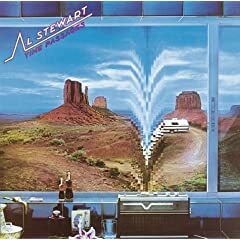 Listen to “Time Passages” by Al Stewart. Taken from his 1978 album of the same name, Al Stewart’s ‘Time Passages’ is all about the power of memory, and the fact that memories sometimes appear out of nowhere and surprise you – either happily, or not. Stewart started his career in the 60s, and built somewhat of a reputation for period pieces – neo-folk songs which were set during the course of historical events (‘Roads to Moscow’) or centred around figures in history (‘Nostradamus‘). But by the mid-70s, he began to get a lot of radio play around a slick soft rock approach, one of the biggest being the title track off of his 1976 LP Year of the Cat, which was a travelogue tale of romance. But, ‘Time Passages’ for me has always been a favourite, because it ironically transports me back to my childhood, and the sounds of late 70s- early 80s radio. But another big reason is that the song resonates with me – that I believe that when memories of places and people in the past rise up in one’s mind, it can make time itself seem like an illusion. This isn’t an entirely new idea. The English Romantic poet William Wordsworth who wrote in the 1700-early 1800s thought it to be pretty compelling too. There is something comforting in that idea, although I’m not sure what it might be. Maybe it’s the idea that the events in a life are connected to something greater, that they are as important as events to come because they help to define our points of view, our very personalities. Where it is not helpful to be stuck in the past, neither is it helpful to discard it. Our past is part of what makes us what we are, after all. At this point in time, everyone must think that I’ve got my head stuck in the late 70s to mid-80s when it comes to this whole ‘songs in my head’ thing. What can I say; Jungian radio (AKA – the song that pops up in your head for no reason…) has a will of its own. Fun fact: Al Stewart is credited for having been the first songwriter to drop the dreaded ‘F’ bomb in a pop song, although he himself doesn’t agree. Al Stewart is a wonderful artist. And Peter White, who plays on so many of Al’s albums, is an incredibile guitarist. I have 11 of Al’s albums. Time Passages is a very good song, yet on that album I prefer ‘Life in Dark Water’, ‘A Man for All Seasons’, and ‘The Palace at Versailles’. Al frequently dabbles in history, and his ‘Roads to Moscow’ and ‘The Last Day of June, 1934’ (both from the album ‘Past, Present, and Future’) are exceptional examples of that work. Moscow! Not Leningrad. That’ll teach me to write without the record in front of me. I have a terrible head for titles. Thanks for the recommendations. Al’s early career, pre-YotC is not very well known by a lot of people, including me. I hope you’ve had time to check out the interview which I’ve linked to in the article above. It’s a pretty fascinating read. I did read the interview. I first learned of AS with YotC like a lot of people. As is my wont, when I like an artist I start looking for previous material. At the time, only ‘Past, Present, and Future’ and ‘Modern Times’ were available (his first four albums were not in the US). I got them both and think they are great. They cemented my admiration of Al. With ‘Time Passages’, those four albums are probably my AS favorites. Much later, a two-CD set called ‘To Whom It May concern’ was published, which contains some tunes from the first four albums that had not been available in the US. I think it’s a bit disappointing, and I can see why All trashes them in the interview. There’s a few good moments, but altogether not impressive. So his first four albums were not much, his next four are incredible, and after that he’s had many more which I think are all good — which is why I keep buying them — but not up that work he did from ’74 to ’78. The better albums after TP in my opinion are ‘Famous Last Words’, ‘Between the Wars’, and his latest, ‘A Beach Full of Shells’.